Mr. Jean-Louis Veaux, Programme Manager on Rural Development, Delegation of the European Union to the Republic of Uzbekistan and Mr. Olivier Durand, Senior Agriculture Economist, the World Bank Country Office in Uzbekistan visited Regional Office of the International Center for Agricultural Research in the Dry Areas (ICARDA) in Tashkent to look for ways to work with the CGIAR Regional Program in the field of sustainable agricultural development for the better livelihood in Uzbekistan. 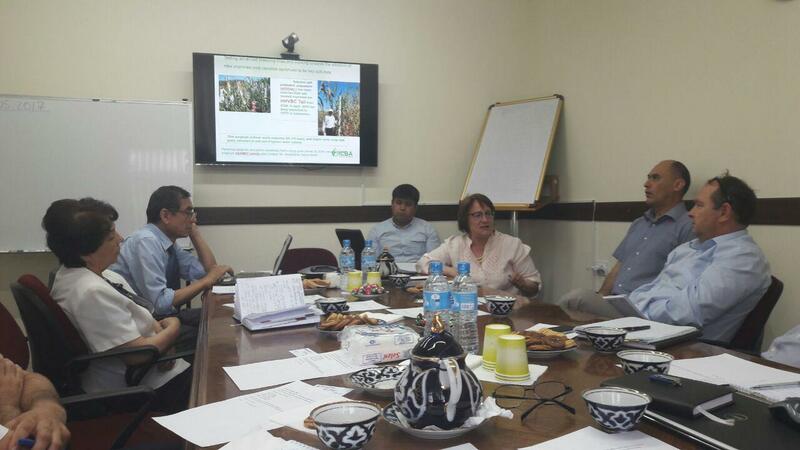 On May 31, 2017, Scientists and Regional Coordinators of the Consultative Group on International Agricultural Research (CGIAR) Program's Centers operating in Central Asia and the Caucasus (CAC) region (ICARDA, Bioversity, ICBA, IWMI, WorldVeg) and CACAARI brought their unique perspectives of addressing current challenges in agriculture to share with guests and give insights into the future of agriculture to make it very promising. The meeting was notable for the broad-spectrum of agricultural aspects presented, which ranged from new improved varieties of different traditional and non- traditional food and feed crops, vegetables and fruits, and sustainable land and water management technologies integrated as crop-livestock farming systems. The research outcomes presented by the Program members included technologies and solutions developed by the Centers to increase crops yields and quality, improve the nutrient use efficiency, combat soil and water salinity and save water and land resources, to name a few. The team members mentioned the need for new breeding technologies and improved seed-production systems suitable for CAC countries, with particular reference to Uzbekistan. During the meeting, new knowledge collected and compiled within different projects to help farmers improve their profitability were presented. Concluding the presented reports, Mr. Jean-Louis Veaux and Mr. Olivier Durand mentioned the importance and need of joining efforts of the international agricultural research centers with decision-makers, donors, government institutions and the private sector to speed-up the process of research outputs implementation and solve the existing environmental challenges to food security in Uzbekistan. The need for structural changes in agricultural research to develop effective knowledge-transfer approach was also highlighted. It was also recommended to encourage local governments establish a strong National Dialogue with involvement of local Institutions to shape right approaches. The collaborative support was demonstrated by the complete engagement of everyone вЂ“ Program team members and guests. Such dialogues make possible the process of building a new research for development frames and statements that would help raise resources to translate the scientific ideas and expertise into the actual outputs that can have a real impact on improving food and nutritional security in the context of climate change.